At ARK Burlington Danes Academy, we offer a lot more than academic excellence. We offer a wide range of activities to all students from all Year groups. Enrichment helps students to develop their interests and abilities, provides valuable learning experiences outside their studies, and promotes independence and interpersonal links with students in other Years. 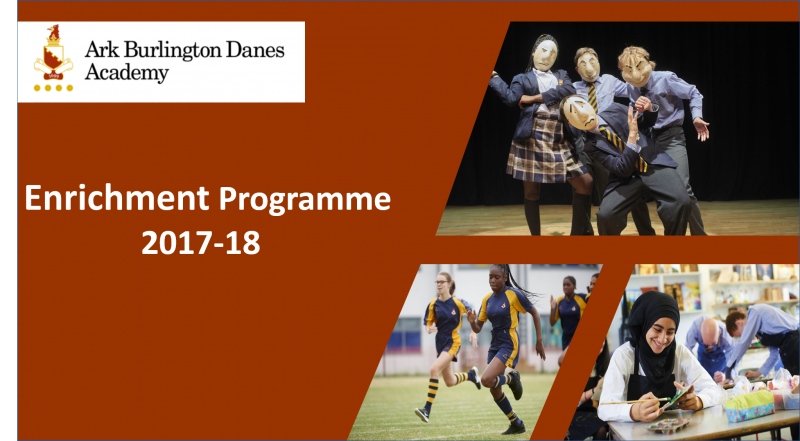 All of our students receive a copy of the new Enrichment programme at the beginning of every term and the students choose which of the clubs they will be attending. This year all YEAR 7 students will also undertake an enrichment evening on a Monday after school. This will be a chance for every YEAR 7 student to develop a new skill, meet new people and experience the thrill of an exciting enhanced curriculum. There are a wide range of team and individual sports to choose from. Our students compete against local schools and in national tournaments. Music is vibrant. Students can join the orchestra, string, woodwind and brass chamber ensembles and the choir, giving public performances each term. The annual Performing Art productions and are highlights of the year. 6th form students produce and direct a play with each class of younger girls and the standard is high. There are also opportunities for students to take part in whole school productions, both on stage and behind the scenes. Students can take part in the Duke of Edinburgh Award. Students support a number of charities through the House system where in March we designate a whole week to raising funds for the six chosen charities. Fundraising provides an opportunity for students to have fun and work together with other Years. Clubs and activities take place at lunchtime and after school, incorporating interests such as debating, trampolining, playing chess or making jewelry through our very popular silversmithing, and if a particular interest is not covered, we support our students in starting their own clubs. Students are also given opportunities to visit amazing places as part of Enrichment. Recent trips have included visits to London theatres, Geography and Science field trips to the south coast, and journeys further afield, to Berlin, Rome, Amsterdam and the USA. “Exciting", "interesting", "challenging" and "fun" are just a few of the words that have been used to describe the Enrichment programme at ARK Burlington Danes Academy. The programme runs at lunchtimes and after school with the majority of clubs delivered on Monday, Tuesday, Wednesday and Thursday from 1540 until 1700. All of our students receive a copy of the new Enrichment programme at the beginning of every term (see below) and the students choose which of the clubs they will be attending. This year all YEAR 7 students will also undertake an enrichment evening on a Monday after school. This will be a chance for every YEAR 7 student to develop a new skill, meet new people and experience the thrill of an exciting enhanced curriculum. All of the clubs are completely free to our students and some even offer the chance to gain an additional qualification, for example first aid and the Duke of Edinburgh Award. School trips are a great opportunity to learn outside the classroom in new, interesting and practical ways. They form an integral part of the Burlington Danes experience, and each pupil at the Academy can expect to have at least one outside trip per year.